The Ehler-Danlos Syndrome community (with support from the American Pain Foundation) is expressing strong opinions to ABC after the network's Medical Mysteries series featured an episode about EDS, an inherited condition that affects the structure of connective tissue throughout the body. Folks with EDS generally have "fragile skin and unstable joints," though the syndrome has a wide range of manifestations, according to the Ehler-Danlos National Foundation. 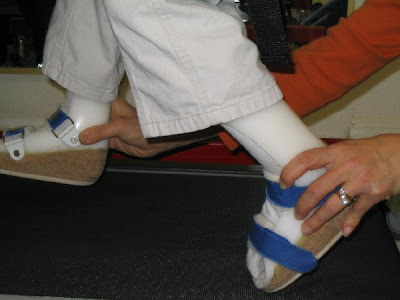 Media attention, when it comes to EDS, almost invariable focuses on those with very hypermobile joints and "elastic" skin-- the "party tricks" of the impairment. "Circus Star is Real-Life Elasti-boy" trumpets the ABC press release. Where's the harm? Well, for one, it's tedious to tell the same story over and over again. Any show that can be summarized as "Hey, look at this guy!" is hardly an innovative use of any medium. And sensationalizing bodily difference doesn't really educate or "raise awareness," it just encourages unwarranted pity and voyeuristic stares. Worse, if the only story about EDS that the public ever sees is this kind of gee-whiz coverage, it distracts from the more pressing concerns and everyday issues important to people with EDS: the distorted public perception can interfere with timely identification and treatment, and stigmatize those with the diagnosis. The ABC Primetime message board is lit up with eloquent protests from the EDS community, and some pretty clueless responses from the show's producers. They describe difficulty in finding a doctor to take their pain seriously, they describe daily pain and frequent surgeries, and the real possibility that the effects of their EDS will be fatal someday. "No, EDS is not at all a funny disorder worthy of a circus side-show," explains one viewer. Just reading of the "blogging news" can consume your life. But one of the bytes that penetrated my consciousness over holiday break was the prognostication that we have now hit a stabilization point for blogging. The point had been reached where the number of time-tested blogs fading out roughly equalled the number of blogs making their debut. When Disability Studies, Temple University made its debut nearly 2 and 3/4 years ago with this humble post, blogging just beginning to hit the big time, and a number of educators in disparate fields, but particularly in literary fields such as English, where turning to blogs as a way to reach a broader audience and to facilitate group work. Blogs chronicling the disability experience, let along the field of disability studies, were in their infancy. Much of the interchange in the field of Disability Studies took place through the medium of listserves. A tremendous amount of energy continues to be devoted to discussion on listserves such as Disability-Research out of Leeds, and DS-HUM (Disability Studies in the Humanities) and SDS (open to members of the Society for Disability Studies) in the United States, that operate as members-only clubs. The content of these often exciting and useful exchanges is lost to the much broader community of non-subscribing Disability Studies acolytes. In my own modest way, I set out to change that. Perhaps the credit for getting DS,TU off the ground should go to Lydia Fecteau, an adjuct faculty member at The Richard Stockton College of New Jersey : she created an excellent blog for her Disability and Literature course that is still in our blogroll, and shared the interesting blogs created by students at her school. Or perhaps credit should go to a reference librarian here at Temple University, Brian Schoolar, who started posting his news to a page directed at faculty in the College of Education. Brian gave me a lot of useful tips in the early days, and we conducted an initial training, "Introduction to Weblogs and Blogging," for faculty, staff and students in the College of Education. Brian eventually discontinued the College of Education blog: I think he found his efforts to be a little bit premature, since faculty in our college were still largely unaware of blogs, and certainly did not subscribe to RSS readers. Of course, the entire tone and feel of the blog changed soon after Penny Richards submitted her first post [Saturday, Apr 16, 2005] and we got serious. Keep posted - we look forward to celebrating our 'anniversaries' later in the spring. What triggers these reflections? In this month's Disability Blog Carnival #7, Penny notes several comrades including Gimpy Mumpy who have set their keyboards aside and directed their energies otherwise. And now word emerges that one of the post prolific bloggers of the past three years, Michael Berube, is following suit. His blog archives will remain, but active blogging ceased as of Tue, Jan 9 2007. Fittingly enough, given the critical political tenor of many of his posts, Michael signing off with a YouTube with the famous atomic bomb finale from Dr. Strangelove, under the moniker "I told you it was going to happen." Don't worry - we don't show any signs of flagging yet. Welcome to the seventh edition of the Disability Blog Carnival! As the invited themes for this edition were "Disability History" and "Disability in the Arts," I present a three-act carnival, complete with historical costumes, dancing, multimedia, and, as always, plenty of comedy and drama. The overture is beginning, so please take your seats. Tokah at From Where I'm Sitting is thinking about music, hearing, and Beethoven; the Goldfish observes the disparate treatments of "mad" Mary Lamb and James Hadfield; Thirza is considering Charlotte Perkins Gilman's classic, "The Yellow Wallpaper," and Blue is reading about Helen Keller through Georgina Kleege's new book, Blind Rage; and CaptaiN DandY has Martin Luther King Jr. Day observations. In much more recent history, Steven Kuusisto appreciates in memory the brilliant oral interpretations of Scott given by Lance Mannion when Kuusisto was a graduate student; and Imfunnytoo recalls her turn as an actor, in college. Places, please, dancers! Zephyr reports about a friend's bad experience in ballroom dance lessons; Wheelchair Dancer participated in a school assembly program with West Coast Dance; when art reveals life: Dave Hingsburger describes how a roleplaying exercise in an abuse-prevention workshop turned frightening--it's a post every parent, teacher, and advocate should read. Calling home on an iPhone? Blind bloggers have been disturbed by Apple's continuing reluctance to make the iPhone accessible to blind users; but Dave Wallace at lifekludger notes that it's also inaccessible to folks who use a stylus or wear gloves--it only responds reliably to the touch of bare fingers. Thinking of a cruise? Candy Harrington says "visitability at sea" is something to think about. Hungry? I suggest one of Sara's kabocha muffins. And get me one too, this carnival is running long. Or maybe just some apples and celery. Tikvahgirl hails a TV comedy that gets postpartum depression right; Andrea has to explain the mockery of the short in Shrek--to her daughter of short stature; Disgruntled Ladye found inspiration for a new stairs strategy by watching an animated TV show; Estee Klar-Wolfond recommends (and links to) "In My Language," a truly beautiful video by Amanda Baggs; Hershon suggests checking out the French film comedy Paris Comme sur les Roulettes; Ruth reviews the new Netflix service, "Watch It Now," as an attractive alternative for film fans that find DVDs unwieldy; Paul Crichton assesses accessibility of music download services; Noelle Perese is concerned about the lack of captions on a lot of online video content; and Troy finds that, even when he wants to buy all the cool new media gadgets, he's still invisible to customer service reps at the shops. One place you might not want high-tech: in the hospital, where video relays are replacing in-person ASL interpreters. Hmmm. --go read the rest; Amanda at ballastexistenz is also posting her poetry, with some unexpected imagery for depression and joy; meanwhile, Karen likes Mark Droslbaugh's new book, On the Fence: The Hidden World of the Hard of Hearing; Kristina's looking at Stephen Hinshaw's The Mark of Shame: Stigma of Mental Illness and an Agenda for Change; Kathleen Seidel is commenting about Roy Grinker's Unstrange Minds; Dave Hingsburger was reading a Jo Nesbo novel, The Redbreast, and watching the film Notes on a Scandal--they have something in common, he notes; and Liz Spikol passes along the call for the Brain Storm Poetry Contest. Gimpy Mumpy has recently ended her fine blog--a pity to see it go! Lily at Recovering Nicely is also getting out of the blogging business--just when I added her feed to my growing collection. Farewell. I'm tired of well meaning noncripples with their stereotypes of what I can and cannot do directing my life and my future. I want cripples to direct their own programs and to be able to train other cripples to direct new programs. This is the start of something big -- cripple power. On this date in 1939, Edward Verne "Ed" Roberts was born, one of four sons raised by Zona and Verne Roberts of Burlingame, CA. He was fourteen when his whole family contracted polio in 1953. He finished high school only when his mother persuaded the district to waive requirements like physical education and a driver's license. Then he set his sights on college: Berkeley. He had to sue the state Department of Vocational Rehabilitation, and he encountered significant resistance at Berkeley, where a dean declared, "We've tried cripples before and it didn't work." Eventually, he was admitted as an "experiment" in 1962, and settled into the student infirmary, which was the only building where he could live with his iron lung. Other quadriplegic students soon followed, also housed in the infirmary--and the independent living movement began to brew. In the 1960s, there were no curbcuts on campus--these students (the "Rolling Quads") had to lobby for them, and for a disabled students program on campus. Ed Roberts earned a BA and an MA from UC Berkeley, in political science. (He began doctoral studies in the same department, too.) 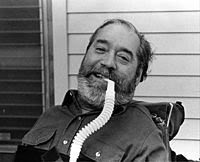 He became known as the "Father of the Independent Living Movement," founded the Berkeley Center for Independent Living (1972), and was later appointed state director of the Department of Vocational Rehabilitation (the agency he once had to sue). He also helped establish the World Institute on Disability in Oakland, in 1984--the same year he won a MacArthur Foundation "genius" fellowship for his vision and leadership. "I've always figured it took no more energy to dream big dreams as little ones," he explained. After a Washington DC memorial service held for Roberts in 1995, Ed's chair was donated to the Smithsonian Institution, where it remains in the National Museum of American History, as part of a growing collection related to the US history of disability and disability rights. Tabatabainejad filed a civil rights lawsuit this week, against UCLA and the university police. Part of the suit says that the campus police violated his rights under the ADA. Tabatabainejad has a diagnosed bipolar disorder. "He told the officers he had the condition and the officers' response was to Taser him and hurt him rather than deal with him as a person with a disability," said his attorney Paul Hoffman. Today, the excellent California Disability Community Action Network e-newsletter (sent out by its tireless director Marty Omoto) forwarded the Sacramento Bee's recent obituary of James Warren Sanford (free registration required), a disability rights advocate here in California who was best known for his work on public transit accessibility and safety. 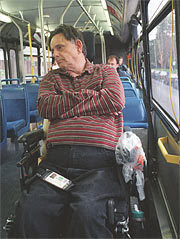 In 1988 he filed a federal lawsuit that resulted in a settlement under which the regional transit system agreed to train drivers in safe operation of the wheelchair lifts and other devices, and more respectful treatment of senior and disabled passengers. CDCAN is a valuable resource for a lot of reasons, but I always appreciate these notices of people who aren't widely famous--they're just hardworking people who leave a legacy of real change for the better in their communities. Sanford was one of those. One hundred years ago, German psychiatrist Alois Alzheimer presented the case history of a 51-year-old woman with dementia named Auguste Deter that would eventually be the basis for the diagnostic label AD. This anniversary will be marked at several major international conferences by celebratory accounts of a century of scientific progress in unraveling the mysterious pathology of the disease. 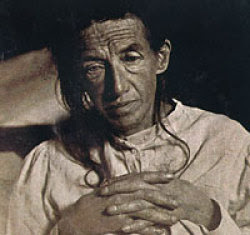 Although the striking photograph of Auguste Deter (shown above, right) will likely be seen often in these festivities, her actual experience and the experience of people who suffer with dementia is not likely to receive serious attention. Penn State's Conference will mark the anniversary by bringing together scholars from around the world who do research on various aspects of the history and experience of Alzheimer's disease. In recent years, people with cognitive disorders and their advocates have challenged the idea that selfhood is destroyed by the loss of cognitive abilities. Taking the experience of people with dementia and other cognitive disorders seriously has thus opened a re-examination of current concepts and practices among clinicians, researchers and care providers, and raised new and difficult questions for biomedical ethicists and policymakers. Taking this experience seriously has also troubled the boundary between cognitive disorders and normality, opening up new possibilities for scholars in the humanities and social sciences who work on questions of memory, selfhood, and culture. The 100th Anniversary of what has become perhaps the most prominent of cognitive disorders offers an opportunity to bring together scholars from around the world who are working on various aspects of the experience of dementia and other severe cognitive disorders, but who seldom have an opportunity to share their ideas and insights across the disciplinary boundaries that have divided the modern university. For more information about participants, topics, and reservations, check the website for the Rock Ethics Institute at Penn State, or contact Dr. Jesse Ballenger . 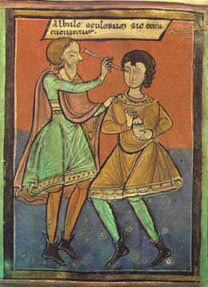 The second conference on Disease, Disability and Medicine in Early Medieval Europe, AD 400-1200 will focus on questions of what constitutes a healthy body in the medieval world, health care, cure and the language of care. The meeting aims to be a forum for scholars working on the topic in a variety of disciplines and regions of Northern Europe, including all aspects of disease, disability and medicine. The conference aims foster interdisciplinary approaches and we invite contributions from archaeology, palaeopathology, history of medicine, as well as history of religion, philosophy, linguistic and historical sciences. Please send abstracts (no more than 300 words) to Dr Christina Lee by 28 February 2007. To get some ideas of what kind of work is presented at these conferences, see the program from last year's conference on Disability in Medieval Europe. PS: Thanks for the contributing medical student who suggested read the original medical journal article on the procedure. I am tracking it down, but in the meantime you may to read the views of the author Dr. Douglas Diekema, recently interviewed by CNN. He headed the ethics panel that evaluated the parents' request back in 2004. Disability Blog Carnival #6 is up NOW! Go see! Emma the Wheelchair Princess, even with an ear infection, has given us a lovely new edition of the Disability Blog Carnival, focusing on relationships: family, friends, community stories. There are quite a number of new-to-the-carnival bloggers featured--that's always great to see--and as usual, some very powerful posts. The seventh Disability Blog Carnival will be here at DS,TU, on January 25, with special themes on "disability history" and "disability in the arts." Nominate your own posts or those of other bloggers by January 21 at the blogcarnival site, or email me, or just leave a comment. Would you like to host? Our two February dates are still up for grabs. I'll go with just one February carnival if we don't get a second host--but please consider volunteering. It's fun! I didn't want to post about this story. I don't make a secret of being a parent, but I'm not a momblogger and I only rarely mention my kids here (I think). However, the last 24 hours have seen a lot of pundits saying "Unless you have a child like this, you can't understand..."
Okay then. I have a child "like this": my son is eleven, on the verge of puberty (we presume), doesn't walk, doesn't talk, etc. etc. He's very small (under 40 lbs. right now), but that could certainly change in the next few years; he has a well-controlled seizure disorder, but that too could change in the next few years. When his cognition is given a number, it's given in terms of months, though I don't put much emphasis on that kind of assessment. We carry him a lot. He's hard to carry. He's not going to get easier to carry. The day may come when we need help. And still, I don't understand. I don't understand removing healthy tissue and functioning organs--it's hard enough to schedule and endure a surgery when it can't be avoided. Puberty is not an extraordinary event. Growing is not a sin or a disease--it's what kids' bodies do, even disabled bodies. When we need help, we'll get it, somehow--but my son's body is fine as it is. And one more thing: my son is no angel, no doll, no pet. He's a kid. He's a person. He's a human being. Treat him that way. Postscript: Stories about parents who (quietly) find doctors to do appalling things to their disabled children do circulate among parents and teachers (and I imagine doctors and nurses and other professionals). I remember hearing long ago about a family that had their kid's vocal cords surgically altered because the kid couldn't talk, and the noises he (she?) did make were unpleasant to them. You hear stuff like this, sometimes. I generally hope and pray that they're urban legends, or at least distorted reports of something less troubling; when I heard about the Ashley case about a year ago, I wanted to believe it was one of those. But when a family puts up a website to explain their decision, that hope is surely lost. and Thirza has an important point to make at Fit of Pique: "Not all caregivers are nice people." Too true. Today marks the birthday of Louis Braille (left; his bicentennial is just two years from now), developer of the eponymous braille system. If you know what an "awl" is, and you don't work leather or crossword puzzles, it might be because (like me) you read a biography of Braille in your childhood. It's hard to forget the story: three-year-old Louis became blind after he was struck by a stitching awl in his father's saddle-and-harness shop. 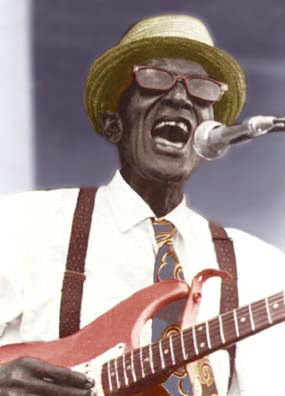 He attended Paris's Royal Institute for Blind Youth from the age of 10, where he became a talented musician. The six-dot braille system was based in part on a twelve-dot "night writing," an invention intended for military use that never quite caught on. Braille's code can be used as notation for any written language, and has also been applied to music and mathematics. Braille himself published a method of writing music with the raised-dot system, and helped invent a mechanical device for producing braille text. 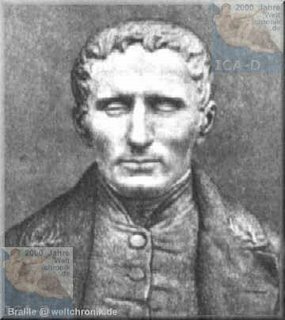 Louis Braille didn't live to know his system would be widely embraced; he died in 1852, at the age of 43, from tuberculosis; his remains were buried in the Panthéon in 1952. Wonder what he would have made of braille jewelry. And one more tidbit: There is an asteroid named for Braille. We've tumbled down this staircase before, haven't we? No, crowds would just look more fit because nobody with a disability that prevents stairclimbing (and that doesn't just mean wheelchair users) would be visible in public spaces anymore--not to mention some pregnant women, anyone pushing a stroller, etc. etc. Only the tidy fit people with no icky wheels, canes, crutches...hm. Just like the bad old days (which aren't even over yet, of course, by a long shot). Do "green" architects and their admirers really want to go back to that being the goal, rather a clear violation of civil rights laws? Is the social exclusion and stigmatization of a large segment of society such an easy option? Apparently for some, it is. Be afraid. And be visible, while you still can be. Today marks the 130th anniversary of the birth of Croatian painter Slava Raskaj (shown at left), born on this date in 1877, in Ozalj. 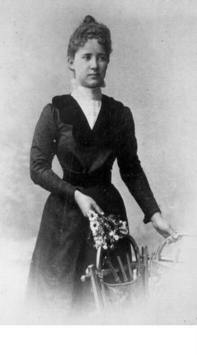 She was deaf from infancy, and at age 7, she was sent to live at a school for the deaf in Vienna. At fifteen, she left the school with some art training, studied further in Zagreb, and pursued a career as a watercolorist, finding some success with her striking landscapes, portraits, and still lifes. However, in about 1900 those around her began to see increasing evidence of mental instability, and in 1902 she was again institutionalized, this time for insanity. 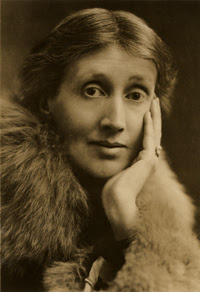 She died in a Zagreb mental hospital in 1906, at the age of 29. 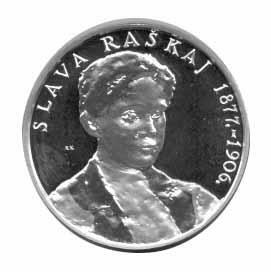 Slava Raskaj, sometimes called "the Croatian Frida Kahlo," has since been remembered with her image on a Croatian commemorative coin (at right); and on film, first in a 1993 short documentary, and then in a 2004 feature film, titled 100 Minutes of Glory in English. A school in Zagreb that focuses on deaf education and speech/language therapies, is named Centre Slava Raskaj for her. Douglas Baynton, Jack R. Gannon, Jean Lindquist Bergey, Through Deaf Eyes: A Photographic History of an American Community (Gallaudet University Press 2007). Brenda Brueggemann and Cynthia Lewiecki-Wilson, eds., Disability and the Teaching of Writing: A Critical Sourcebook (Bedford St. Martins 2007). Hilary Cooper, Divided Portraits: Identity and Disability (Umbrage 2007). Benedicte Ingstad and Susan Reynolds Whyte, eds. Disability in Local and Global Worlds (University of California Press 2007). Paul Jacobs, Neither-Nor: A Young Australian's Experience with Deafness (Gallaudet University Press 2007). Petra Kuppers, The Scar of Visibility: Medical Performances and Contemporary Arts (University of Minnesota Press 2007). Raymond Luczak, ed. When I am Dead: The Writings of George M. Teegarden (Gallaudet University Press 2007, part of the Gallaudet Classics in Deaf Studies series). Martin F. Norden, ed. The Changing Face of Evil in Film and Television (Editions Rodopi 2007). Carol Poore, Disability in Twentieth-Century German Culture (University of Michigan Press 2007). Ato Quayson, Aesthetic Nervousness: Disability and the Crisis of Representation (Columbia University Press 2007). Carol Thomas, Sociologies of Disability and Illness: Contested Ideas in Disability Studies and Medical Sociology (Palgrave MacMillan 2007). Tanya Titchkosky, Reading and Writing Disability Differently: The Textured Life of Embodiment (University of Toronto Press 2007). Watermeyer, Brian, and Leslie Swartz, eds. Disability and Social Change: A South African Agenda (Human Sciences Research Council 2007). Weber, Mark C. Disability Harassment (NYU Press 2007).